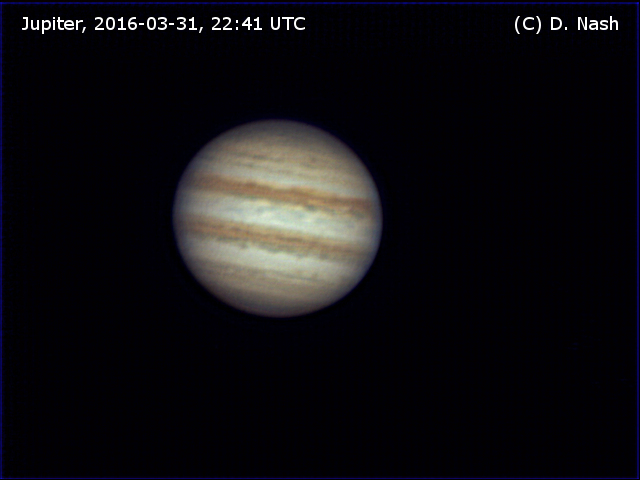 Here is my latest picture of Jupiter: it was captured last month (March 2016). It is rare these days that the sky is clear and I have time to image. I almost thought I would have forgotten how to do it, but I was able to get this image which is not bad for me. I used my Orion UK SPX 250 newtonian telescope with a 3x Imagemate, and a TouCam 740 webcam. 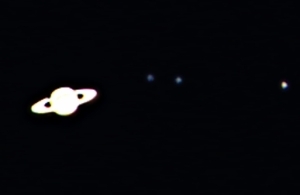 The image was processed in Registax and The Gimp. Click to pop up full image. 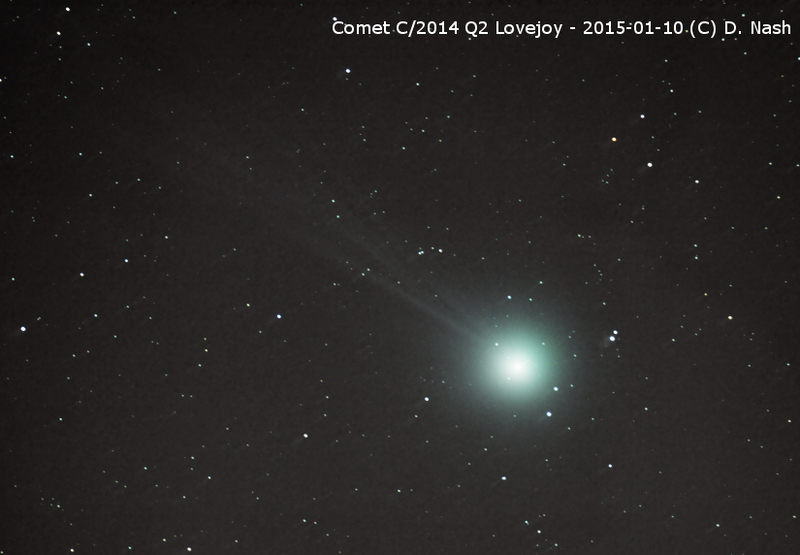 Comet C/2014Q2 "Lovejoy " is now visible from the Northern hemisphere. It appeared brightest on 10 January 2014 and will be visible for several more weeks as it gets closer to the sun before Perihelion on January 30th. Click the image to see the full-sized picture. Mars comes close to Earth every 18 months or so. 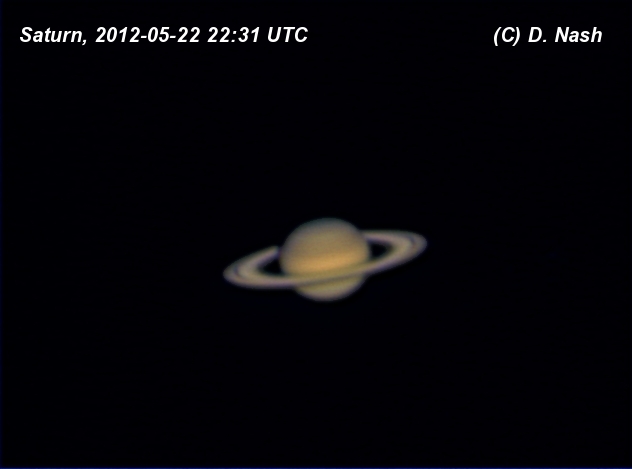 This year opposition was on 8 April, and I was able to image the planet that night. This image was captured from my Orion SPX 250 telecope using an AE 3x Imagemage. The camera was Philips ToUCam 740 and I captured separate colour (using a Baader IR blocker filter) and luminance (using a home-made IR-pass filter). Each of these was around 2500 frames stacked in Registax 6, using 2x drizzle, sharpened with wavelets, and post-processed in The Gimp. Click the picture to see it in a separate window. 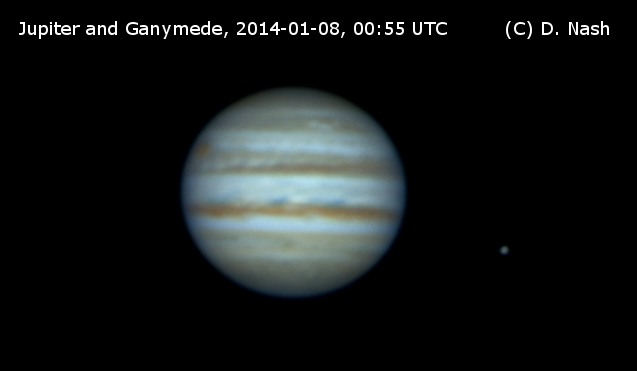 In this very wet UK winter I found some gaps between cloud banks and took some images of Jupiter. The two images shown here show a stack of 740 frames from around 1200 captured at 00:44 and a stack of 800 frames from around 1700 captured at 00:55. 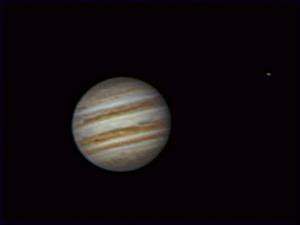 Both the images show the red spot moving around the planet to the left, and also Jupiter's largest moon Ganymede in its orbit. 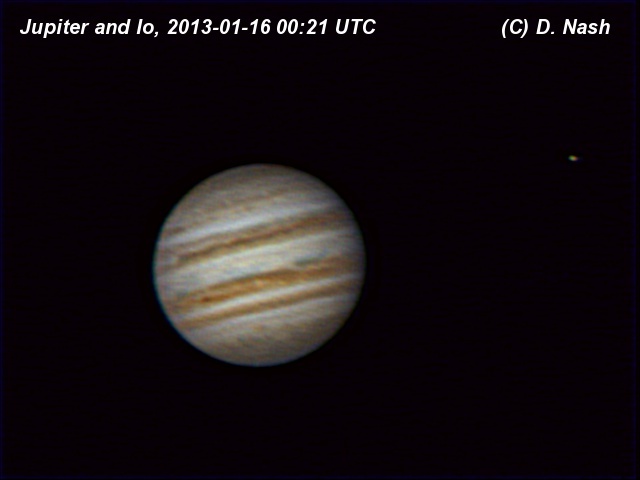 Here is an image of Jupiter I captured a few days ago - my first of 2013. 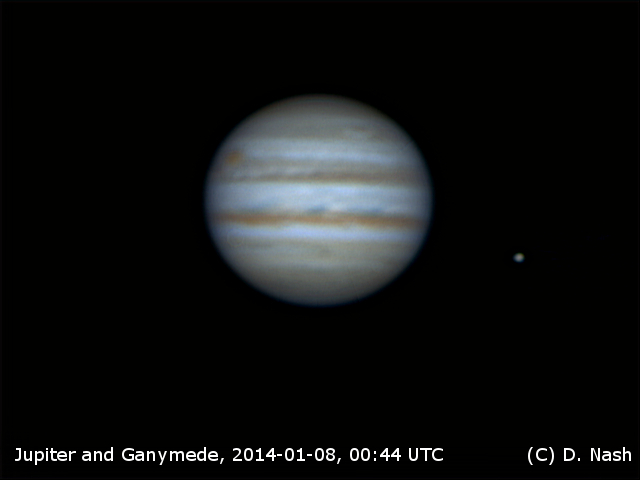 The Galilean moon Io is visible on the right of the picture. Click the picture to see the full-sized version. Seeing and transparency were not good in the sky on 23 November and there was a lot of humidity and mist in the air. 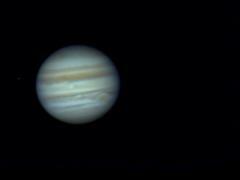 However Jupiter was shining bright and I knew the Great Red Spot was going to be on view, so I captured a couple of AVIs of 3000 frames each with varying settings. 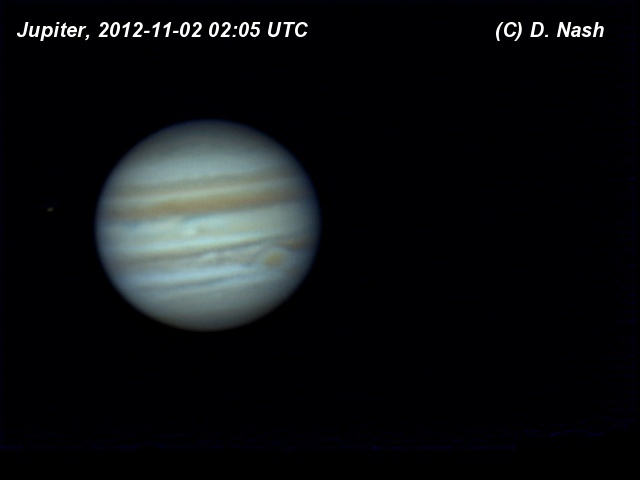 Here are a couple of recent pictures of Jupiter. Each is 300 frames stacked from a capture of 3000 frames. I have found recently that best results seem to be from capturing on the ToUCam 1/33sec exposures at 10fps, at least it takes less time than capturing at 5fps although in theory 5fps should be better due to no compression. On the night of 1-2 November, it was pretty windy and seeing wasn't good. The image turned out not too badly though. 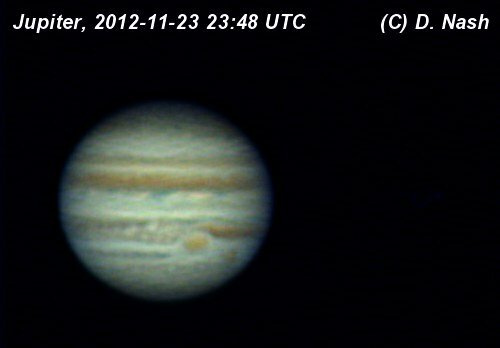 Seeing was also not great on the night of 5-6 November, and the second image below was the result. 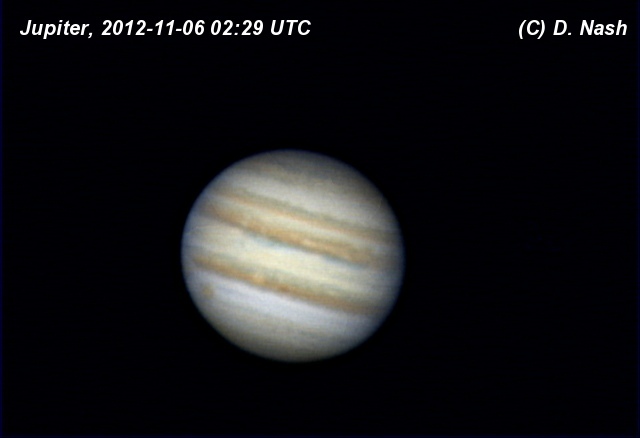 Images were both aligned and stacked in Registax 6, manually specifying alignpoints, and for better alignment and frame selection I use a two-stage process, selecting 50 from the first run and clicking "Align with Processed" from the Wavelet tab - after first having applied a light wavelet and no RGB alignment. Then I align again and stack 300 from the full 3000. This time in the wavelet tab I use RGB align, slightly more wavelets, and a little adjustment via histogram. Click each image to see the full-sized version. Jupiter is now rising early enough that I can see it rise above my house around 3am. I imaged it on the night of 14 October, capturing 3000 frames and stacking 300 to create this picture. 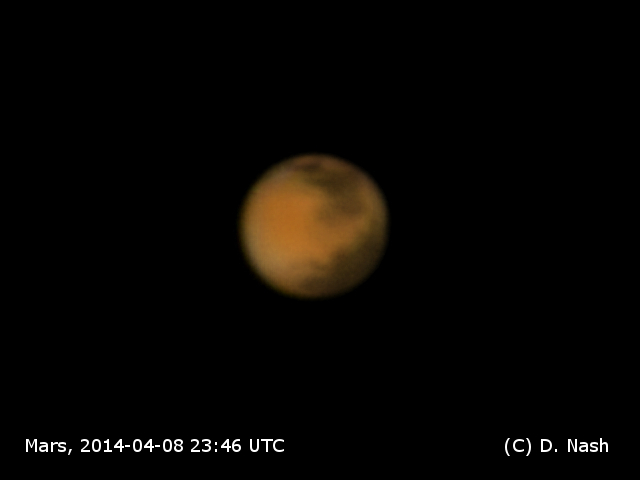 Imaging was done using a ToUCam Pro with 3x Imagemage on a SPX250 f6.3 Newtonian telescope. Capturing in K3CCDTools, alignment, sorting and stacking in Registax 6. 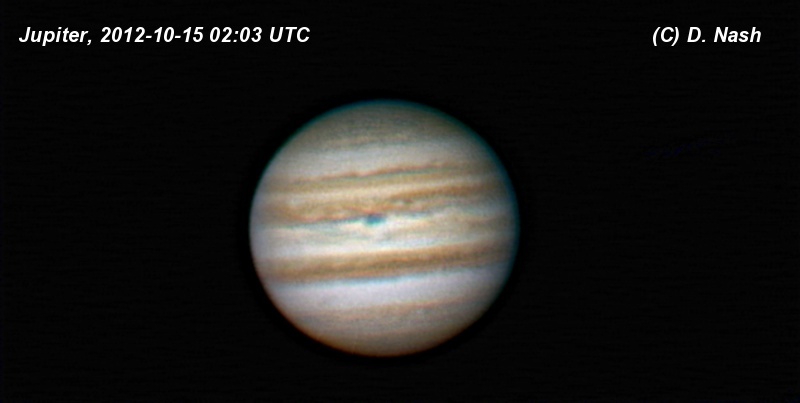 Wavelet processing in Registax and further sharpening and resizing in The Gimp. The weather in the UK has finally improved and yesterday was the hottest day of the year here in Eastern England. I took the opportunity of a clear sky to have a look at Saturn, now just past opposition in the southern sky. Seeing was fairly good and I captured a couple of streams of images using my venerable ToUCam 740 attached to my Orion Optics SPX250 newtonian telescope, which is my standard planetary imaging setup. I used an Astro Engineering 3x Imagemate for two pictures of the planet itself, then removed it for a wider field showing the planet and some of its satellites. Click the image to the left to see the full sized picture. At the time of writing, we know of 53 moons around Saturn which we have given names to, plus another 9 provisional ones with numbers. 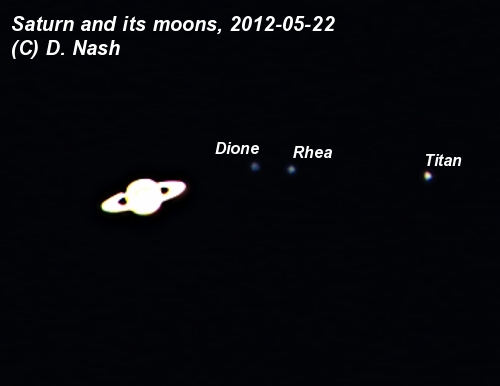 My picture shows Dione, Rhea and Titan, the latter of which is the largest and most easily seen moon. All three were discovered in the 1600s and were among the first ever found. Click the image to the right to see the full-sized version. 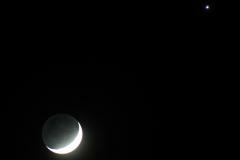 Recently it's been exceptionally good for seeing planets in the night sky. Mercury has now sunk out of sight but a few weeks ago you could see that planet plus Venus, Jupiter, Mars, and if you were willing to wait up a few more hours, Saturn - all in the same night. The recent pairing of Jupiter and Venus even made the TV news since they are two very bright objects in the sky. 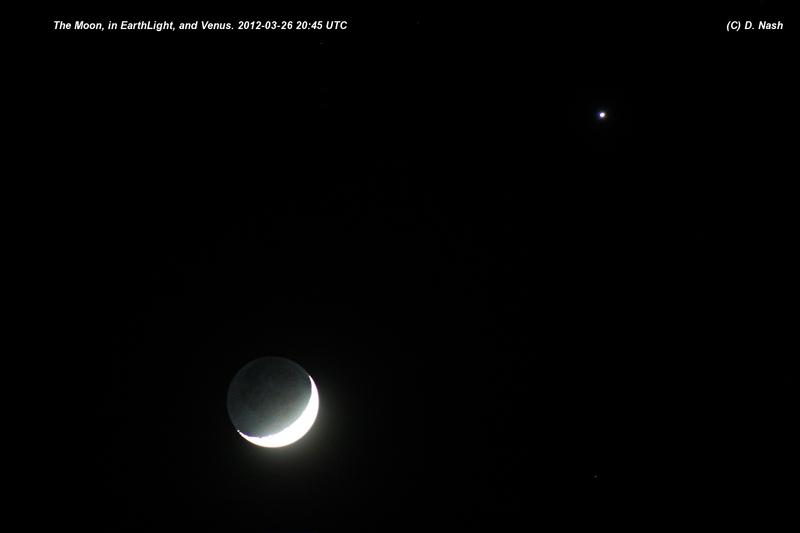 Here is a more common pairing, that of the crescent moon with Venus. Since Venus is closer to the sun than Earth, when Venus is high in our sky and the moon is in an early phase, they often appear close together after sunset. When the moon is a slim crescent you will often be able to see the rest of the lunar globe dimly lit by "Earthshine" or the light reflected back from the Earth. Such light has been reflected twice on its journey from the Sun to your eyes - from the Earth to the Moon, then back to you on Earth. This is also known as the Moon's "Ashen Glow", or "The New Moon in the Old Moon's Arms". This picture was taken with a Canon 300D Digital SLR using a cheap Optomax 300mm lens (found on Ebay for �10). The image was converted from Raw mode using RawDrop, then contrast was tweaked slightly before presentation here. Click the picture to see the full-sized image.